This bundle includes many activities such as scenarios, task cards, conversation starters, interactive activities, social stories and games. This set includes 100 game prompts and a quick overview of how they can be used. 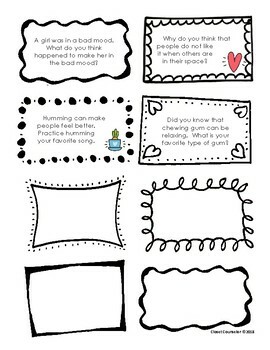 They are ready to be printed on card stock and are a tool that can be used over and over with many different children. 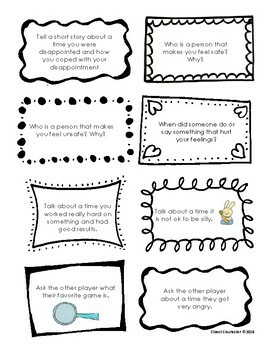 It is an old trick to make mainstream games and turn them into social skills activities. 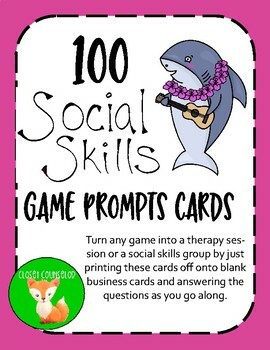 This takes another step of work out up by creating card prompts that ask social skills and social emotional questions to help a child better communicate and learn their social and emotional needs. This can be used 1:1 or as a group setting. Children do better during an activity if they feel that the questions they are answering are random. These cards ask questions that have to do with anger management, coping skills, anxiety and depression without being overwhelming to a child.